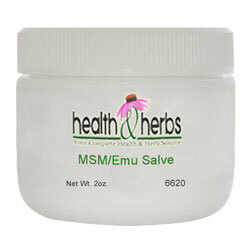 Emu salve penetrates the skin layers below the surface to aid in the healing process of burns, diminishing scarring and improving flexibility after surgery. It is bacteriostatic which does not promote the growth of bacteria, and won't cause irritation or clog the pores. This herbal salve can also be very helpful for chapped lips, cold sores, stretch marks, rosacea, hemorrhoids, canker sores, bug bites, cosmetic peels, keloids, puffiness around the eyes, facial lines, swollen tissue, sunburn and radiation burns, acne moisturizer, age spots, callused feet, cracked fingers, razor burns and nicks, rashes and contact dermatitis. Emu oil contains fatty acids oleic acid, (omega-9 fatty acid), linoleic acid (omega-6 fatty acid), and linoleic acid (omega -3 fatty acid), which are believed to be beneficial when applied to muscle aches, joint pain, and specifically arthritis pain because of its localized anti-inflammatory effect. Lavender oil is one of the most versatile of essential oils and has a relaxing effect on the body. Therapeutic-grade lavender has been highly regarded for the skin and may be used to cleanse cuts, skin irritations, and bruises. It may also ease the pain of bee sting and insect bites, to stop the itching and reduce the swelling. Lavender oil is also found to decrease the pain of minor burns and helps to kill bacteria when cleansing wounds. The extract of Lavender in a salve can help with dry, chapped skin, sunburned or chapped lips, cold sores, and it helps to eliminate dandruff. Pure vitamin E oil has been used for skin and hair care, as well. It offers antioxidant properties and promotes circulation of blood to the skin. It also helps to alleviate fatigue and strengthen capillary wall while nourishing skin cells. Another wonderful benefit of vitamin E is that it can be used to treat scars, acne, and wrinkles because it speeds up cell regeneration. This creates an anti-aging effect, which can make the skin look and feel younger. Ingredients: MSM, Cocoa Butter, Organic Coconut Oil (Refined), Emu Oil, Lavender Oil, Tea Tree Oil, Vitamin E Oil, Glucosamine sulfate, Chondroitin sulfate, Helichrysum Oil, Beeswax. Instructions: Massage the cream directly on sore joint or affected area, or areas. Repeat as needed. Warning: Keep out of reach of children. For external use only!